In the November 6th, 1935 issue of Motion Picture Herald, an announcement was featured stating Frank Goldman had left Audio Productions to join the Jam Handy Organization. 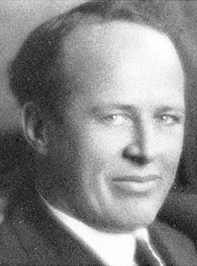 Following his arrival, Jam Handy made a number of films remise of Goldman’s Audio industrial films and two of which, “The Master Hands” and “A Coach For Cinderella”, are dramatically similar to Goldman’s “Rhapsody In Steel”. ). “The Master Hands”, a three reel live action production released in May of 1936 as an entry in the Direct Mass Selling program, is literally a remake of the first half of “Rhapsody In Steel”. While no one is (currently) credited as the director, the fact that such a similar production would be made after Goldman’s arrival makes one wonder if he worked on the film. “A Coach For Cinderella”, a one reel Technicolor cartoon (in which trades credit Frank Goldman as it’s director) released in June of 1937 is an adaption of “Rhapsody In Steel’s” second half. As of 2018 there is no documentation linking the three films together, however an explanation for this could be explained by observing events taking place around the same time regarding General Motors. To briefly recap last week’s article, the “Rhapsody In Steel” was a highly respected film. While it’s success may have been overlooked by Hollywood, it certainly would not have been by Ford Motor Company’s competitor General Motors and the maker of their industrial films, the Jam Handy Organization. Five months prior to Frank Goldman joining Jam Handy in November, the United Auto Workers union formed and was working to recruit unhappy General Motors’ employees as members. Observing the UAW’s activities and the reception of “Rhapsody In Steel” , one can see why Frank Goldman would have been asked to remake the film. As a matter of fact when looking at the timing of events, it may not be too far fetched to assume Frank Goldman was originally hired by Jam handy to make a “Rhapsody In Steel” styled film for Chevrolet. Credits to “The Master Hands”. Notice how a directors credit is not present. The first of the two Chevrolet films was “The Master Hands”, and while it does not feature animation it’s still worthy of discussion due to its extreme similarities to “Rhapsody In Steel” and relationship to “A Coach For Cinderella”. While the three reel “Master Hands” may be an adaption of the “Rhapsody In Steel’s” first reel/half, in no way is it a clone and is instead an extremely different film. The cinematography by Gordon Avil has a more triumphant look when compared to Leo Lipp’s atmospheric styled work. The music score composed by Jam Handy music composer Samuel Benavie is also dramatically different than Edwin Ludig’s score. Benavie’s original score for “The Master Hands” is heavily inspired by the classical music of Wagner and Mendelssohn (Mendelssohn’s spinning song, “Spinnerlied” is used throughout the production), and also by the factory machinery. (It is possible that like Edwin Ludig, Samuel Benavie was asked to compose the score at the Chevrolet factory). 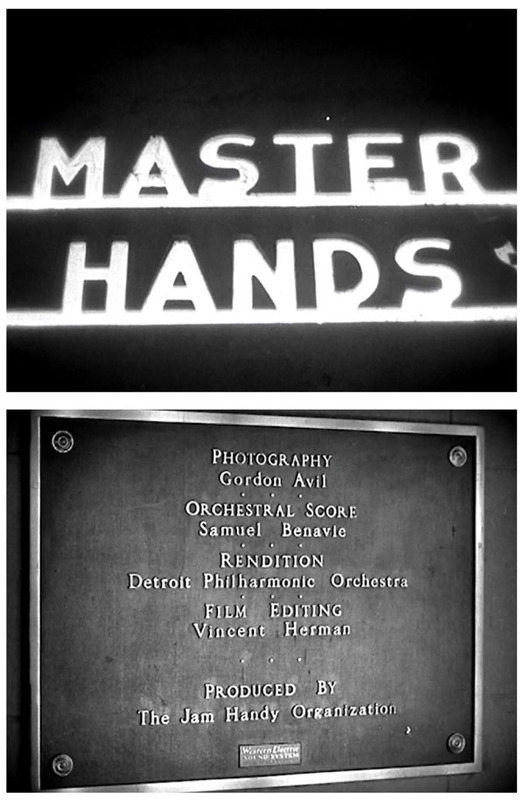 Through Benavie’s score and Avil’s beautiful black & white cinematography, “The Master Hands” triumphantly portrays the Chevrolet assembly line as a well orchestrated symphony that General Motors employees proudly make possible. 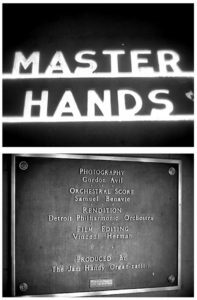 “The Master Hands” was registered for copyright on May 27, 1936 and appears to have been released that day non-theatrically and theatrically as a Direct Mass Selling release. In addition, as indicated by the May 27, 1936 issue of Variety, it was also the main attraction in a General Motors employee-only caravan show that also featured a one reel Jam Handy Film “The Steeple Chase” and eight vaudeville acts. The caravan show toured the various General Motors factories around the country and appears to have been done to help ease labor tensions. However as history shows, the caravan was unsuccessful as the Flint sit down strike still occurred in the end of December 1936. Despite failing to prevent a strike “The Master Hands” was still positively received as a Direct Mass Selling release by the general public and trade magazines. 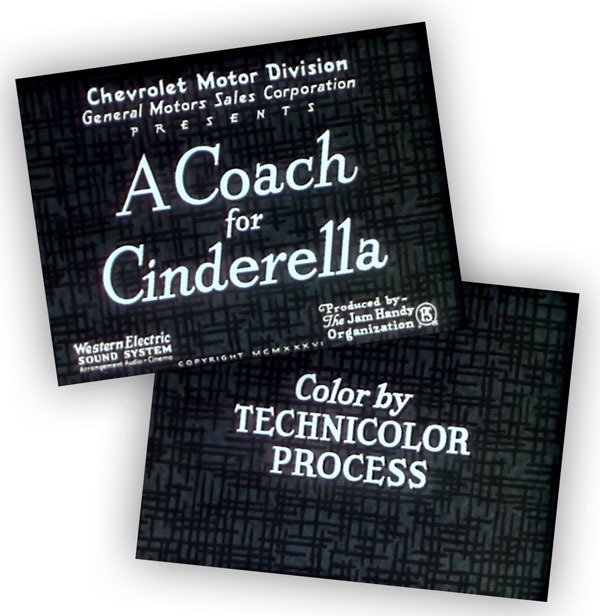 Almost a year following the release of “The Master Hands”, the studio released the three-strip Technicolor animated cartoon “A Coach for Cinderella” in June 1937, which trade ads credit Frank Goldman as the director. (This would be Goldman’s second three-strip Technicolor cartoon, his first being Audio Productions’ highly applauded 1934 cartoon “Once Upon A time” that was sponsored by the Metropolitan Life Insurance Company.) While not quite the adaption “The Master Hands” was, “A Coach For Cinderella” is similar in it’s own way to the second half of “Rhapsody In Steel”. The cartoon is centered around Nicky Nome who, like the V8 Imp, orchestrates the assembly line process amongst his fellow gnomes to happily and easily assemble a car for their caregiver Cinderella. Light humor, along with an enchanting music score by Samuel Benavie shows how the assembly line is beneficial to everyone, in this case Nicky Nome and Cinderella. Two similar, animated foremen: Ford’s ‘V8 Imp’ and ‘Chevrolet’s Nicky Nome’. “A Coach For Cinderella” was distributed theatrically to movie theaters by the Jam Handy Organization and Monogram Pictures where it was included as an added attraction, and also non-theatrically for showings at schools, Club Meetings, etc. and free outdoor screenings. The non-theatrical screenings were probably the most effective, as in 1937 it was one of the only three-strip Technicolor films shown non-theatrically, making it a true treat for audiences at schools and free outdoor screenings (where usually on black & white films were shown). The audience reception for both non-theatrical and theatrical screenings seems to be positive as indicated by Business Screen Magazine. 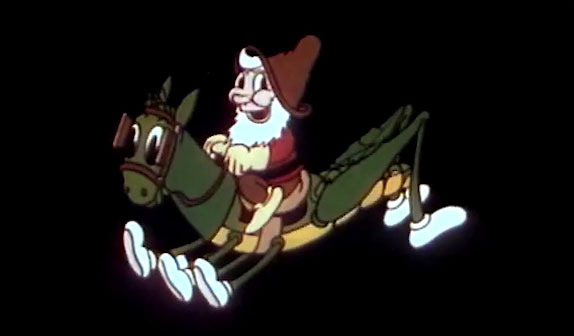 The magazine labeled it as an outstanding production for 1937/38, and frequently cited the cartoon in articles that discussed the benefits of using animation for commercial and industrial purposes. The Jam Handy Organization was also very proud of the cartoon as the company used it as a demonstration piece and frequently showed it to potential clients. Long after the discontinuation of the Direct Mass Selling program with the arrival of World War II, the Jam Handy Organization along with General Motors continued to distribute the film well into the 1950s for school showings. 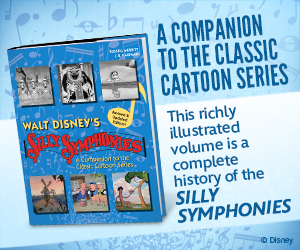 Even when viewing the cartoon today and looking at it’s history, the cartoon is a bit more ambitious than the typical Silly Symphony imitators produced by other studios such as Van Beuren or Screen Gems. 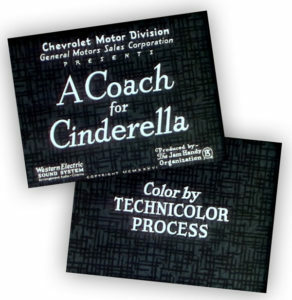 Unlike Burt Gillet’s Rainbow Parades or Charles Mintz’s Color Rhapsodies that were trying to run Walt and Mickey out of town, “A Coach For Cinderella” takes advantage of the Technicolor cartoon format to offer a fun learning experience and is certainly not trying to compete with Disney. While the cartoon certainly has its flaws (Goldman, while certainly ambitious with his filmmaking was unfortunately not the best animator), its still noteworthy and is an interesting piece of history. 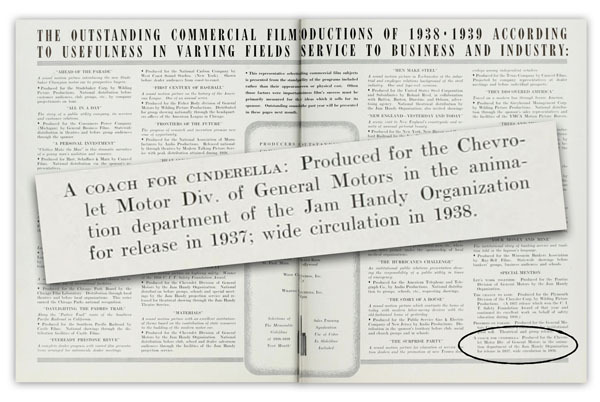 Business Screen Magazine credited “A Coach For Cinderella” as an outstanding production for 1938. Fortunately neither “A Coach For Cinderella” or “The Master Hands” ever fell into obscurity the way “Rhapsody In Steel” did. Much of this has to do with how both films were always offered to the general public in some manner on film, and eventually on video. (“A Coach For Cinderella” frequently made appearances on public domain children’s cartoon tapes.) Another reason why “The Master Hands” and “A coach For Cinderella” are well known is because of the work film archivist Rick Prelinger has done, and is continuing to do, to make both films (along with thousands of other industrial films) available to the general public. When viewing both films, especially in the order of “The Master Hands” and then “A Coach For Cinderella”, viewers can see how Goldman adapted the “Rhapsody In Steel” into both productions. Below is a video that features “The Master Hands” followed by “A Coach For Cinderella” that presents them in the same manner “The Rhapsody Of Steel” plays out. Or if you just wish to watch “A Coach For Cinderella” here is the video below. SPECIAL THANKS to Rick Prelinger and Ray Pointer for help with this piece. Next Week: We’ll take a look at Audio’s official “Rhapsody In Steel” remake for Ford, “Symphony In F”. Then the following week, we’ll look at the Nicky Nome cartoon series that spun out of “A Coach For Cinderella”. Are you sure the 1934 Once Upon A Time was done in three strip technicolor? I thought Disney had exclusive rights to three strip technicolor until 1935. That is interesting about Frank Goldman directing Once Upon A Time. The only other person that also worked on it that I am aware of was John Walworth. The Metropolitan Life credit was spliced out of the print that I have on a videotape that I had. I did not see a year copyright anywhere on Once Upon A Time. A Coach For Cinderella has a 1936 copyright on the film. Have any animators or crew members ever been known to work on A Coach For Cinderella? Mike Maltese could have worked on it in some capacity because he was at Handy between leaving Fleischer studios and ending up at Schlesinger’s studio. I haven’t watched A Coach for Cinderella in years. It was on some bootleg 6hr cartoon VHS I had as a kid. Watching these films that show how a car is made makes me marvel at the fact that the American automobile companies retooled every year for sometimes-radical styling changes during the heyday of the industry (after these films were made, from the postwar period till about 1970). That must have been awfully expensive to do, but the companies were highly competitive, and had the money to do it.